Age Limit : Logistics/ IT- Applicants should Born Between 2-7-1994 to 1-1-2000. Law- Applicants should Born Between 2-7-1992 to 1-7-1997. Educational Qualification : SSC Logistics- Passed BE/B.Tech/MBA/B.Sc/B.Com/M.Sc IT/B.Arch/ PG Diploma in Logistics/Finance/Materials/Supply Chain Mgmt. with minimum 60% Marks from any recognized University. SSC X IT- Passed BE/B.Tech/M.Tech/B.Sc/M.Sc/BCA/MCA Degree in CS/IT/Computers Discipline with minimum 60% Marks. SSC Law- Passed LLB Degree and Enrolled as an Advocate in Bar Council with minimum 60% Marks. 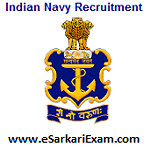 Eligible Candidates can Submit Application at the Official Website of Indian Navy latest by 5th October 2018. Open SSC Officers in Executive Branch(Law, IT, Logistics) Link in Currents Events Section. Open Register Link and Select given Option.